Old Bakery offers multiple changeover days for short breaks as well as weekly holidays. Please check the availability calendar from the Check Availability button above. In the heart of Mortehoe village and surrounded by National Trust coastline, Old Bakery Cottage is in a superb location for a beach or walking holiday. 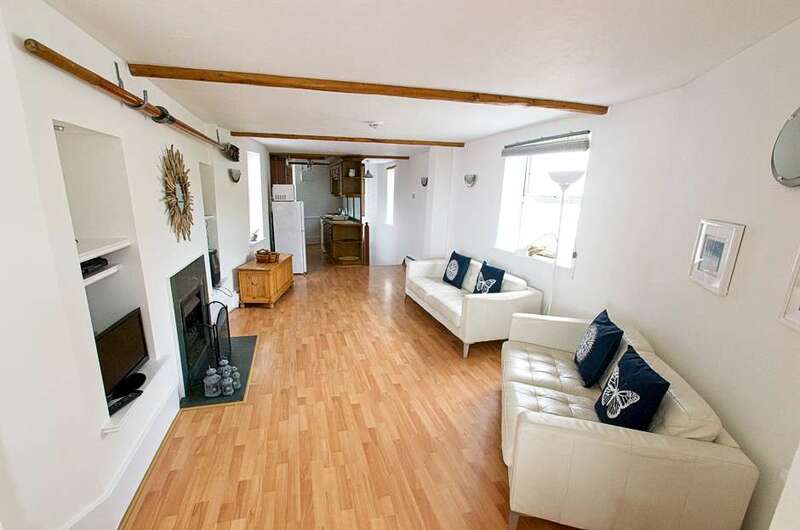 This popular spacious cottage has all modern facilities, superb sea views from the roof terrace and living area and easy access to beaches and coastline. It is ideal for family holidays and accommodates 6 people comfortably, with three bedrooms situated on the ground floor. The cottage is a fantastic base for local beaches and country walks. Of all our cottages in Mortehoe this possily has the best seaviews. Stunning National Trust coastland stretches in all directions and the famous beaches of Woolacombe bay are within walking distance or short hop by car. Pony-trekking, surfing and golf facilities are available locally. Just a 10 minute walk from the cottage is Grunta Beach, great for rock pooling and sheltered bathing and just through the village on the way to the lighthouse is the coastal footpath down to Rockham Beach with the remains of a ship wreck still to be found. Three great pubs serving locally produced food, a Fish & Chips, Deli, two tea rooms, Post Office, village store, church, gift shop, Mortehoe Museum and under 11’s play area are all in the village just minutes from the cottage. This characterful, quirky cottage has the bedrooms on the ground floor and living area upstairs to take full advantage of the views to the rolling hills to the left or the sea in front. There are 2 double bedrooms (one with small en-suite w/c & shower) - 1 room with 3ft bunks - Utility/drying room with washing machine (no dryer) –fitted bathroom – Upstairs is the open plan room with galley kitchen one end with cooker, fridge/freezer, microwave, slim-line dishwasher etc - through to large living/dining room with gas-flame effect fire, 2 white leather sofas, dining table and chairs, TV/DVD and Bluetooth speaker/docking station with USB charger. This cottage also has Wi-Fi. All in all a truly lovely place with a super atmosphere and quirky feel, we think you’ll love it!